Lowes has some paintable wallpaper, but in my opinion it doesn't look like real beadboard. I had it in my project pile to use, then I saw Rhoda's and the wall doctor stuff looks so much better. Back to Lowes it went! Spend the extra ten dollars on the Wall Doctor brand wallpaper. I got mine from the Home Depot, but you can also get it at Graham & Brown. 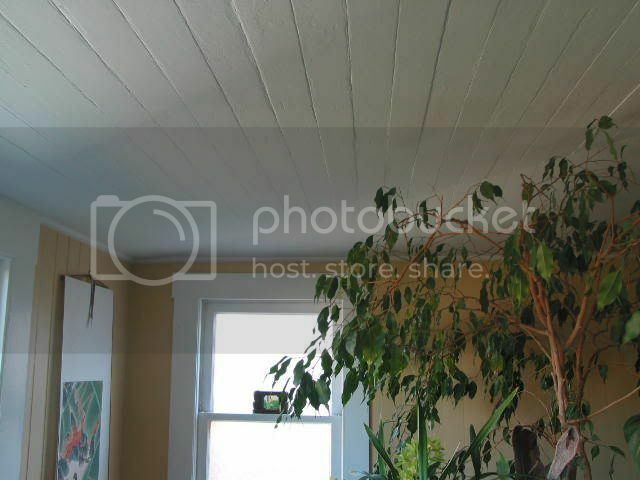 BUT think of the other possiblities: look at what moonkat99 over at the Garden Web forums did to her ceiling, y'all! It's gorgeous! And after: who would ever know it's wallpaper?? 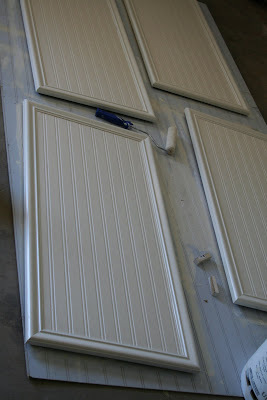 It's DIY day over at Kimba's! Do you think that it would go over texured walls okay, or would the texture show through? I have zero experience with wall paper and never thought I'd want to try it, but this stuff looks A-mazing! I love it! I need to get some for the back of a dresser-I was going to buy the real stuff, but this looks like it would be better. Thanks for the tip! 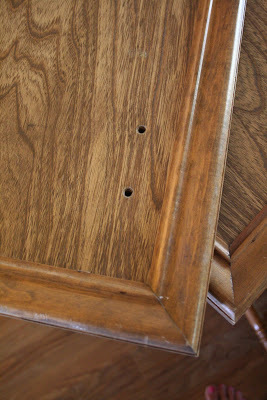 What a good idea to use that bead board wallpaper on cabinet insets. It looks wonderful. That wallpaper is amazing. Thank you for sharing - it turned out beautifully! I want to use it to cover the horrible faux oak cabinet in my bathroom. I read somewhere that the Lowe's stuff was not pre-pasted and I am gathering from your post that the Wall Doctor beadboard wallpaper is. I KNOW that is the way I want to go! Your post gave me a great idea on how to do the cabinet fronts. Thanks so much! Still loving this! It looks so awesome! Thanks for the tip on high traffic areas, we are getting ready to do our cabinets and I was thinking about this! I can't wait to see what you do with it next! you guys are REALLY tempting me with that stuff! LOL What an easy way to make over your cabinets!! Thanks. I've been thinking about this since Rhoda did it. Now I know I'll DO IT. Question- Do you have to prime it or can you just use your regular paint? It looks fabulous!!! I'm racking my brains now trying to figure out where I can use it!!! Wow! 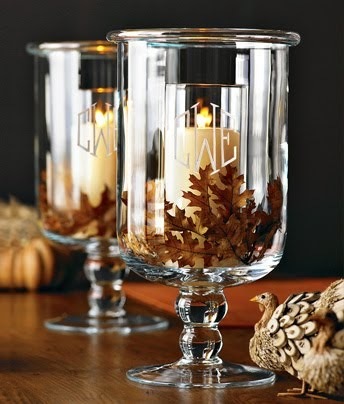 It looks great, such a nice little detail in your room. 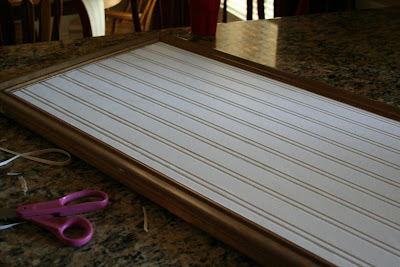 I really want a bead board backsplash in my kitchen. I love the cabinets. They look fabulous. My husband and I are going to be building and purchased some used cabinets. I can't wait to transform them. Oh thanks for sharing that ceiling I was wanting to do that in our kitchen when we build. That looks awesome! What a huge difference. Thanks for stopping by my blog - you're right those are the same numbers you used. I spent about 15 minutes trying to create circle numbers in Word until I remembered, "Didn't I see a font like this on a blog?" Thanks for the tip on free fonts! I know, don't you love how easy this stuff is to work with?? I have more plans for it too, just got to get all my supplies together. I'm really going to do it on my bathroom walls in at least 2 baths & add chairrail. And I knew it would look fab on a ceiling, that pic proves it. If I wasn't so afraid of neck pain, I just might try that too in my tiny bath. Love the cabinets! thinking of using it on my ceiling in the FROG! I have been wanting to try this since I saw it at Rhoda's. I bought it thinking I might use it on my kitchen cabs and entry but now I am afraid it won't hold up. I will play with it in a less trafficked area first. Your's looksgreat. I love the new and improved cabinets! 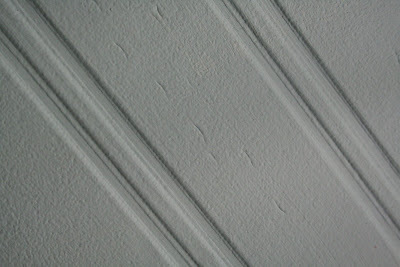 In my opinion, beadboard (real or wallpaper) always looks so fresh and fabulous. Great vision! Unbelievable!!! Thank you so much! I saw some of this on clearance at Home Depot this past weekend. I am heading to my mom's to redo her kitchen next week, and I am going to see what she thinks of this idea. Actually, I am hoping she'll let me put it around her island, rather than on the fronts of the dors. I love the way this stuff looks so real. Thanks for the advice. I think it looks so great. You did a wonderful job. very, very nice! i am pondering what needs a little beadboard around here. if i put it on my wall, do you think it would look believable? Thank you, thank you, thank you for posting this wall paper. 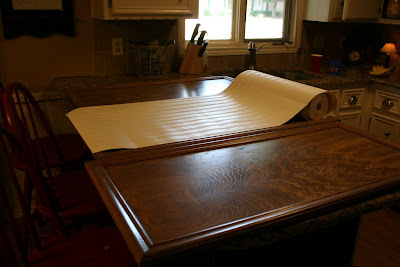 I've been wanting to bead board my kitchen and breakfast room ceilings, but it can get a bit expensive for the area we have. This will be perfect! Hello Melissa - thank you so much for this great tutorial! I've been wanting to do this and judging by your positive experience, I just might try it! Love it!!! I didn't know they made wallpaper like this! I just love this! It looks so good. They are SO MUCH easier than I thought, but wallpaper still makes me a little nervous. You have sure made me tempted though! That ceiling is to.die.for. Gonna go visit her next. I just used the same thing in my bathroom on the cabinet. I will post pictures as soon as I am done. I wanted to use this in my kitchen as well, but after trying it out I have decided against it. It is not durable enough to handle the wear and tear in the kitchen. 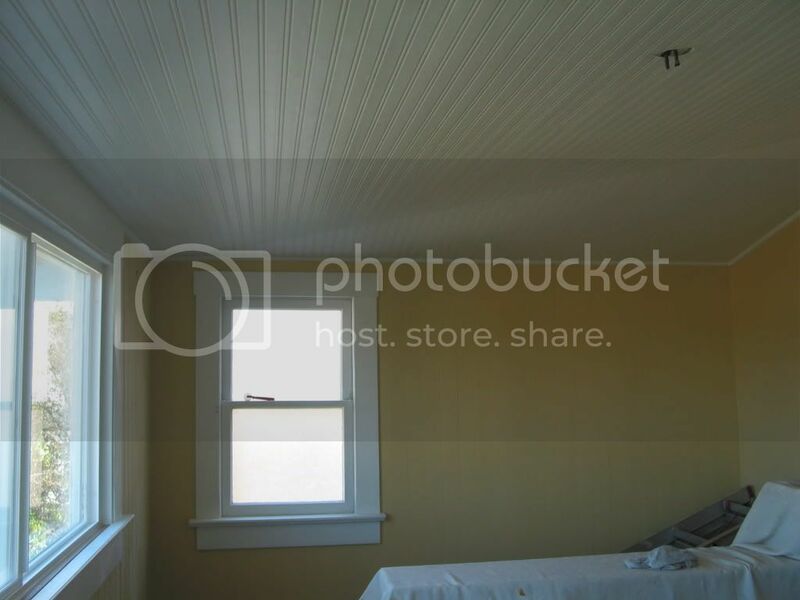 It does look exactly like beadboard though. This stuff is amazing! I'm determined to find somewhere in my home to use it! that's impressive... I've never seen that before... and the end result is amazing... love it. Hey Melissa-Did your sister ever make it to the hot seat with Regis? -I've been trying to watch each time it's on. Has she been on the air yet? 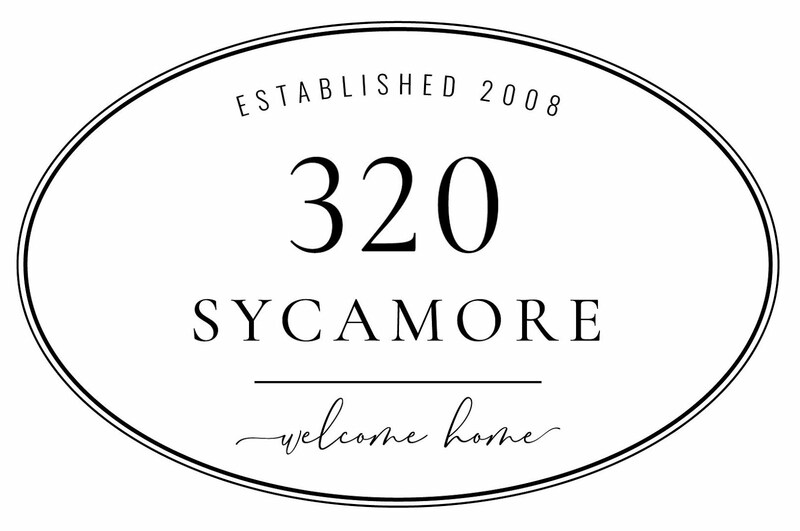 Want $80 worth of items and only spend $20 out of pocket? Read all about how you can do it too It's Just a COUPON - How much can you really save? and it's the last day for entering the give-a-way--and it's Photography art-Check it out!! 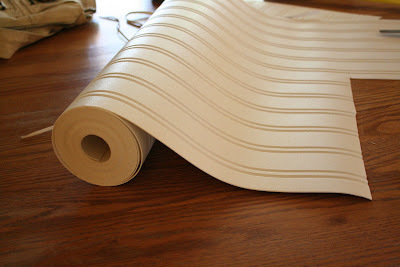 Thanks for posting such great photos of the wallpaper and mentioning that it dents easily. I saw it on Rhoda's blog too and think it's the perfect thing for a spot in my kitchen that doesn't get too much knocking into. I'm definitely going to order a roll now that I've seen your pretty makeover! I just used the same stuff on my kids bathroom cabinet. It looks great, but I have changed my mind about using it in my kitchen. It is way to soft to put up with the wear and tear in a kitchen. In fact, I have already dinged it on one of the cabinet doors. Awesome Melissa!! LOVE these cabs!! HELP! I applied this exact wallpaper under an existing chairail molding in our living room, and three days later IT IS ALL COMING OFF!!! I followed instructions exactly, included how to wet the prepasted paper and let it sit for 5 minutes. I pressed gently to remove air bubbles, and daubed the excess glue off with a rag as instructed on the directions that came with the paper. Looked great! Very satisfying! Bragged to friends that they were going to love! Discovered today that whole strips are pulling away from the wall. Why is it that when I want to remove wallpaper I can't, and when it is supposed to stick, it won't?!! 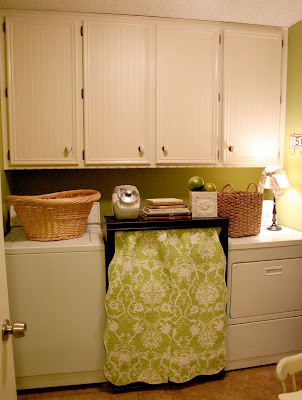 LOVE your laundry room!!! So cute! A tip to the person who had the wallpaper falling down. Did you by any chance put it up over laminate/ panel walls?? FYI - $7/roll less at Lowe's than at Home Depot and it IS prepasted! Wow! I had no idea this even existed. 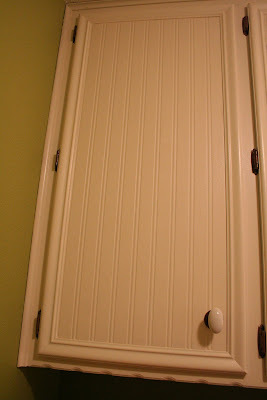 I had just told my husband the other day that when we do new cabinets I'd like to do beadboard. Great to know! Thanks! This is a question for the webmaster/admin here at www.blogger.com. Can I use part of the information from this blog post above if I give a backlink back to your site? Wow, love it! 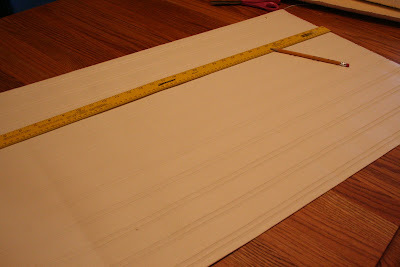 I really have been thinking about ways to afford bead board, now I can do it in all the places I would like. Thanks so much. Love your blog. Thank you, Brandi! Lowes has improved their bb wallpaper now that they sell in the stores...it's just like the Home Depot one that is online. Good luck! i realize this is an old post, but i don't think I've seen it before. your laundry room is beautiful. i love the beadboard on your cabinets. i love the way your home is decorated. you have such a great eye. thanks so much for sharing your tips for hanging the wallpaper too and where to buy. My son put beadboard wall paper in our breakfast room below the chair rail and it looks great. My question is I would like to put it below a chair rail going up the stairs; is there a paint that could be used on it to make it harder so if something bumps against it, it wouldn't dent?